Looking for a Moving Company in or near Beaumont, Texas? 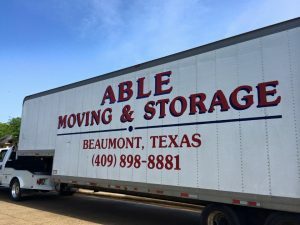 Able Moving & Storage Company, locally owned and operated, has been in business since 1965 serving Beaumont, TX and all surrounding areas in residential and commercial moves. We offer complete moving services which includes packing, moving, delivery and set up. Our goal is to make your move as easy and stress-free as possible. We always aim for 100% customer satisfaction and continue to thrive on repeat business and excellent referrals.